HP Umpire Sean Barber ejected Dodgers LF Matt Kemp and Rangers C Robinson Chirinos (fighting after home plate collision; QOCU) in the bottom of the 3rd inning of the Rangers-Dodgers game. With two out and one on (R2), Dodgers batter Enrique Hernandez hit a ground ball to Rangers right fielder Nomar Mazara, who threw to catcher Chirinos as Dodgers baserunner R2 Kemp arrived at home plate. Replays indicate that once he obtained possession of the baseball, Chirinos legally blocked Kemp's access to home plate, and Kemp, in turn, legally made contact with Chirinos, resulting in a permissible home plate collision pursuant to Rule 6.01(i) and bench-clearing incident during which both players were ejected for fighting, the call was irrecusable. * At the time of the ejection, the Dodgers were leading, 2-0. The Dodgers ultimately won the contest, 3-2, in 11 innings. This is Sean Barber (29)'s first ejection of 2018. Sean Barber now has 6 points in the UEFL Standings (2 Prev + 2*[2 AAA + 0 Irrecusable Call] = 6). Crew Chief Bill Welke now has 3 points in Crew Division (1 Previous + 2 Irrecusable Call = 3). *Rule 6.01(i)(2) allows the catcher to "block the pathway of the runner as he is attempting to score" if the catcher is in possession of the ball. As it relates to runners, Rule 6.01(i)(1) states, "If a catcher blocks the pathway of the runner, the umpire shall not find that the runner initiated an avoidable collision in violation of this Rule 6.01(i)(1)." 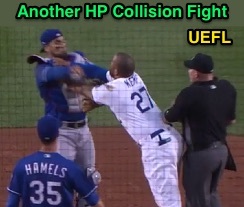 Accordingly, both players were legal and Kemp was properly declared out on Chirinos' tag. See the related post for more discussion on the two parties' responsibilities during a potential home plate collision. This is the 60th, 61st ejection report of the 2018 MLB regular season. This is the 29th player ejection of 2018. Prior to ejection, Kemp was 1-2 (SO) in the contest. This is the 30th player ejection of 2018. Prior to ejection, Chirinos was 0-1 in the contest. This is Los Angeles' 2nd ejection of 2018, 5th in the NL West (ARI, SD, SF 4; COL 3; LAD 2). This is Texas' 3rd ejection of 2018, T-1st in the AL West (LAA, SEA, TEX 3; HOU 2; OAK 0). This is Matt Kemp's 2nd ejection of 2018, 1st since May 11 (Alan Porter; QOC = Y [Balls/Strikes]). This is Robinson Chirinos' first career MLB ejection. This is Sean Barber's first ejection since April 24, 2016 (Melvin Upton Jr; QOC = Y [Balls/Strikes]).